Shopping for a new Nissan Rogue? Middle-of-the-road Rogue SVs offer a surprising number of features—including active safety—for not much money. It’s our pick to start. 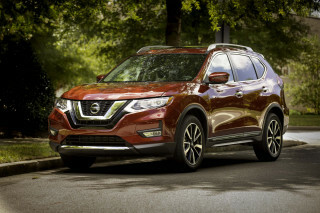 The 2019 Nissan Rogue capitalizes on space and value among small family crossovers. Not every trip to the grocery store or school need be a white-knuckle ride at full speed. We get that. The 2019 Nissan Rogue does too. Reality dictates that good people and good cargo space win the weekday. The Rogue’s low starting price at less than $26,000 is just its victory dance. This year, like last year, the Rogue is available with front- or all-wheel drive; with or without hybrid batteries. The Rogue Sport isn’t related to the Rogue, and we cover it separately. Three trim levels of the Rogue are available: S, SV, and SL. The base version starts at less than $26,000 and although it looks modest, it’s tough enough for toddlers. Ask us how we know. Most Rogues will leave lots powered by a 2.5-liter inline-4 and continuously variable automatic transmission tuned for efficiency, not speed. The EPA rates the 2019 Rogue around 28 mpg combined. All-wheel drive is available on every trim level for $1,350 and doesn’t ding the Rogue too hard at the pump. 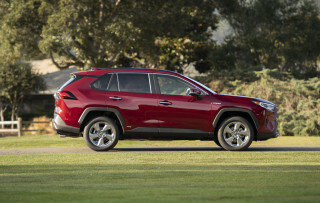 A hybrid version is available that does moderately better: the EPA rates front-drive hybrids at up to 34 mpg combined. Those versions are less common. The good news for the Rogue this year is a wider availability of Nissan’s suite of driver-assist features, which it calls “ProPilot Assist.” The system can help reduce driver fatigue on long interstate jaunts by watching the road ahead and helping drivers stay in their lanes. It’s not a hands-off system, and ProPilot loves to beep if it doesn’t detect human hands within seconds. All Rogues come with automatic emergency braking (lifesaving) and a 7.0-inch touchscreen with Apple CarPlay and Android Auto compatibility (life-improving), among other standard features. There’s better news: The Rogue is an uncommon value in base and middle grades, a relative rarity among hot crossovers that can sell themselves these days. The 2019 Nissan Rogue’s best look is its price—that’s not a bad thing. The 2019 Nissan Rogue doesn’t have time for high-fashion—did you see the list of weekend chores on the fridge? The Rogue’s clean if nothing else. Its exterior follows the crossover crowd with a tall body, and high belt line that rises toward the rear roof pillar. Unpainted fender flares don’t bother with color, probably a testament to the eventual dings they’ll suffer in daily duty. Base Rogue S versions have low-rent hubcaps that can be replaced with a small options package. Dressier SV and SL versions wear more chrome. Inside, function follows form in the Rogue with simple controls that are laid out logically. A 7.0-inch touchscreen that’s standard on all versions dominates attention—even from the high-buck leathers found in tonier trims. Panoramic sunroofs are available on most models that helps brighten the interior and don’t eat too sharply into available head room. A soft ride overshadows modest powertrains in the 2019 Rogue. 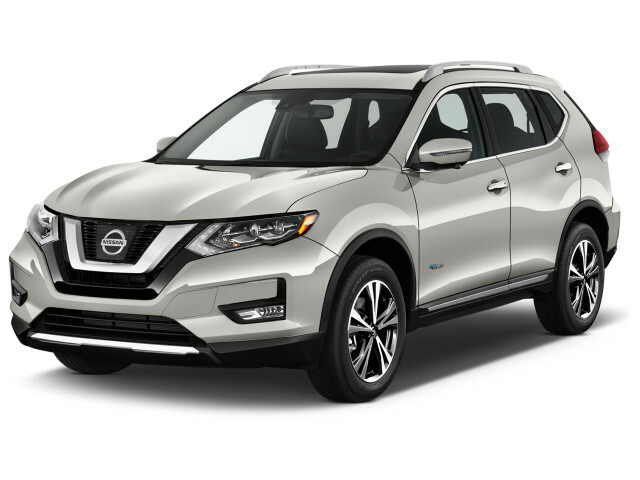 We’re smitten with the ride in the 2019 Nissan Rogue, but can’t say the same about its power and transmission. Most Rogues will leave lots with a 2.5-liter inline-4 that’s rated at 170 horsepower and 175 pound-feet of torque. Paired exclusively with a continuously variable transmission (CVT), it’s hardly thrilling—parking lots are hardly oval tracks anyway. Front-wheel drive is standard on all models, and all-wheel drive is a spend-up option for $1,350 more on every trim level. The Rogue doesn’t prioritize performance from its powertrain, its fuel economy instead. The Rogue returns combined mileage in the high-20s consistently, rain or shine. The standard 17-inch wheels ride softly, but those are reserved for base trims. Most owners will get 18- or 19-inchers that are firmer, but the Rogue’s long wheelbase swallows up fussy road imperfections well. The ride is predictably tippy for a tall-riding crossover, but at least it’s composed on calmer drives. The Rogue gets an 8.4-inch ground clearance that may hint at some off-roadability, but the long overhangs should be an indication: the Rogue is better left on pavement. Opting for the Rogue Hybrid pairs a 2.0-liter inline-4 with a 30-kw electric motor for a combined power output of 176 hp. The performance is still just as relaxed as the regular Rogue, but the combined mileage rises to more than 30 mpg combined. The Rogue Sport is unrelated to the Rogue and is covered separately. Room for five and high-fives, the 2019 Rogue offers impressive versatility for its price. The 2019 Nissan Rogue targets what buyers often ask from their new cars now and delivers with remarkable comfort. The Rogue comfortably seats five with plenty of room for gear and is remarkably durable for a crossover that starts for less than $30,000. Nissan’s good seats in the Rogue aren’t lost on our rumps. The front seats are all-day comfortable and supportive, with only the broadest shoulders looking for more side bolstering. In the second row, rear-seat riders get 37.9 inches of leg room on paper, which is improved by the thin profile of the front seats. The Rogue’s tall roofline offers plenty of head room, even for the tallest passengers. The second row slides fore and aft for more cargo room or more people room, as needed and it’s split in a 40/20/40 foldable arrangement. With the second row down, the Rogue swallows 70 cubic feet of cargo. With the second row in place, the space is a still-impressive 39.3 cubic feet, with underfloor cargo bins for secure storage. Low-priced Rogue S versions wear durable cloth that, while not impressive, doesn’t feel cheap. The cabin in base versions is also clad in low-price hard plastics and black carpet and fabric, but every Rogue feels up to the task of repeated family duty. Stepping up to the SV keeps the same material, but the driver’s seat gets power adjustment and both front seats are heated—hard to find for the same money. Top-of-the-line Rogue SLs get real leather hides, upgraded optionally to two-tone hides that look nice but don’t feel particularly soft. The official safety scorecard is mixed for the 2019 Rogue, but it’s equipped with high-buck safety features that others skip. Federal and independent safety testers don’t agree on the 2019 Nissan Rogue. 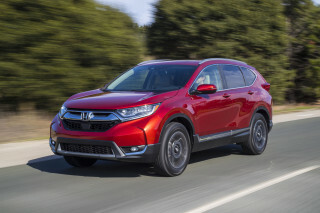 The popular crossover netted a Top Safety Pick nod from the IIHS last year, and automatic emergency braking is standard on all models this year. Nissan offers its most advanced driver-assist features on the 2019 Rogue, but the NHTSA doesn’t have good things to say. Federal testers gave the Rogue a rare four-star overall score for crashworthiness, including four stars for frontal and rollover crash protection. Conversely, the IIHS calls the Rogue a Top Safety Pick after it earned top “Good” scores in all of its crash tests, including the finicky front small-overlap crash test. Automatic emergency braking, which is standard on all 2019 Rogues, was rated as “Superior” at avoiding front crashes. The Rogue can be equipped with Nissan’s suite of driver-assist features dubbed “ProPilot Assist” that can keep the crossover centered in its lane during highway drives and help reduce driver fatigue. Nissan insists the technology isn’t hands-free driving, constant pressure on the wheel is required and the system will warn drivers after just a few seconds if the car doesn’t detect an attentive driver. Similar systems are available from other automakers including BMW, Mercedes-Benz, and Cadillac, but Nissan’s system is equipped on cars that cost far less than those brands. ProPilot assist is available on SV trims and standard on SL grades. Aside from active safety features, the Rogue is equipped with six airbags, traction control systems, and a rearview camera. A surround-view camera system is available as an option or on spendy trims. In base versions, the 2019 Rogue is a value among crossovers; not many competitors can say the same. 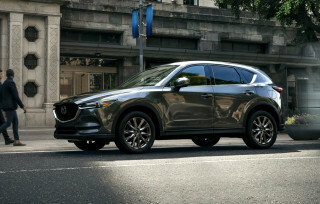 The 2019 Rogue adds to its impressive value this year with some common-sense packages that add safety, driver-assist features, or popular equipment for modest fees. Like last year, the 2019 Rogue is available in base S, SV, and SL trims. A handful of packages add some creature comforts such as a panoramic moonroof, navigation, or a surround-view camera system. Nissan’s suite of driver-assist features is now available as a spend-up extra on mid-grade SV, or standard on SL trims. That’s good value for the money, and many competitors offer some—but not all—of those features on base models. At the top, the 2019 Rogue SL sports 19-inch wheels, power-adjustable front seats, leather upholstery, premium audio, navigation, a surround-view camera system, adaptive cruise control, dual-zone climate control, remote start, a 7.0-inch touchscreen for infotainment, and Nissan’s suite of driver assist features called “ProPilot Assist.” The Rogue SL starts at $32,385 with front-wheel drive, or $33,785 with all-wheel drive. An $1,820 Premium Package for Rogue SL models add LED headlights that were rated “Acceptable” by the IIHS and are how the Rogue earns its Top Safety Pick award. A slow-selling, optional third-row seat was dropped in 2017. The 2019 Rogue keeps pace with others in its class, and the hybrid version does much better. Among mid-size crossovers, the 2019 Nissan Rogue manages merely average fuel economy—one version does much better. Opt for all-wheel drive, which many snow-state buyers will, and those ratings modestly drop to 25/32/27 mpg. That’s just average. The Rogue Hybrid does much better. The EPA rates the hybrid crossover at up to 34 mpg combined. For a popular mid-size crossover, that’s near the tops. 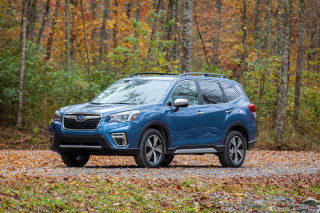 Rogue competitors like the Toyota RAV4, Honda CR-V, and Subaru Forester return combined mileage around 30 mpg. 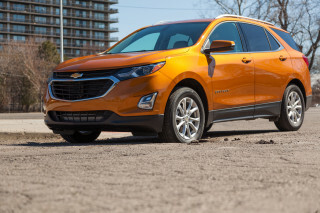 When equipped with a diesel engine, the Chevy Equinox does better at 32 mpg combined, but it’s a pricey powertrain spend-up—much like the Rogue Hybrid. Looking for a different year of the Nissan Rogue?